The best part about the Sensor Gel Stick, is that it can be re-used over and over again and with normal use can last for a long time. But what happens if the gel tip gets less sticky overtime or potentially even completely lose the stickiness property? Some of our customers apparently use the product heavily (even some gear rentals companies use the Sensor Gel Stick) and one of our customers reached out to us asking what to do in such situations. I forwarded the email to our German manufacturer and the response I received was quite simple – just wash it! Apparently, you can safely wash the Sensor Gel Stick with just tap water, let it air dry and it will be as good as new again. I had a hard time believing this, so I decided to test it out on my stick and then use it on my camera to make sure that it actually works. To my surprise, it worked perfectly fine and better yet, it became even more effective than before! So if you end up dropping the Sensor Gel Stick on the ground or drop it on unclean surface, you do not have to waste your sticky paper – just give it a wash and you will be good to go! If you end up with oil / grease on the gel and it won’t wash off, some liquid dish detergents can be safely used to remove oil / grease as well (only do this as a last resort though). Moose Peterson followed the above procedure and he seems to be very happy with the outcome. Is there any solution to clear translucent mirror of sony SLT camera? Sergey, do not use the Sensor Gel Stick for that – it can potentially affect the mirror coating. The best thing to do is to use a dry, lint-free cloth or a brush to clean the dust off. I would not use any chemicals on it. It sounds like the Gel Stick can last forever. A little of topic here but, is the sensor stick sake to use on the D810 since ot doesn’t have a low pass filter? Is the sensor stick safe to use on the Nex 6 and Nex 7? Cornell, only the Sony-specific version is safe to use on the NEX-6 / 7. The Sony version will be here in about a week (still awaiting shipping info from the manufacturer). Nasim thanks I saw Moose Peterson article on that and I did wash it under tap water but after I just shook it and put it back in the plastic case, is that ok? Chris, no, please let it air dry first – the plastic case will not let it dry. Ok it’s been in the plastic case for 2 day’s now, do I just take it out or was it again? thank you. I don’t think you need to wash it – just make sure that it is dry and it should be good to go. You are most welcome Greg! This material has been around for a while but not used in this manner. It is not a miracle but you have to beware that there are different manufacturers and materials. It will not last forever and will deteriorate. I had one and it left smears and smudges. I would not jump to this process. Mark, did you use our product, or some other product? Which one left smears and smudges? Today I ended up taking my camera to have it serviced, hopefully, this can be fixed and I will get rid of Eyelead Gel Stick, I can’t trust it anymore. Will this work on my canon dslr’s 7D and 5DM3? Wonderful news but I’d like to add one caveat — all tap water isn’t created equal and contain a variety of minerals and additives. Perhaps a better option is to use distilled water. (Which is recommended in everything from auto radiators to sleep apnea machines). Now I could be just overly concerned but when I lived just a couple counties north of where I do now, the tap water was notably harder than it is where I am now. Also, some communities add a small amount of fluoride to the water, etc. Earle, those are good thoughts for sure. If one is concerned, I guess distilled water would be safer to use. Thanks for sharing! I read this article last night and since I have been using, (perhaps over using), the gel stick before every paid assignment I took a look at it and decided to give washing it a try. Then I thought about the water and decided to use some of the distilled water my wife adds to her piano since I won’t even drink tap water here in Virginia. I would like to add a bit of information regarding drying. When I finished washing the head in distilled water I thought just standing the gel stick up in the drain board at the sink would not be a good idea as the air in Virginia is full of dust and pollen that gets everywhere. I stood the gel stick up in a small glass and covered it with a one gallon food storage bag being careful not to allow the bag to touch the gel stick. This morning upon inspection with my sensor loupe the head was perfect. Thanks for letting us know about this procedure. Although you are correct, a frost free refrigerator will dry the gel stick, I wonder, since there must be moisture in the gel part itself, if this method won’t dry out the gel stick. Rafael, that one I am not sure about :) Make sure to warm it up in room temperature before using though – you don’t want to put icy gel on your sensor filter. Mike, that’s an excellent suggestion, thank you! I’m willing to buy the sensor gel stick, but have not done so yet because I still have a pair of Sensor Swabs (yup, the one with methanol in it) still new. So, if I’d buy the stick by now I’d have to wait until I use all the swabs as I don’t want to waste them; I barely use them to clean my sensor (maybe twice a year) because I don’t change lenses too often in “unfriendly” environments. Rafael, keep those Sensor Swabs for wet cleaning – you will need them! The product works very well in combination with wet cleaning, because it picks up any residue that’s left after wet cleaning and it does a good job with picking up remaining lint/dust after you use a swab. Wet cleaning is still a good method to clean when sensors get really nasty (especially when oil ends up on the sensor). This is slightly off topic. I have a stick and it is great on a D800 but I also have an older NEX5 that I sometimes use when travelling light. You market a different (less sticky) stick for newer Sony cameras but I do not know whether that is needed just for the later models or also earlier ones. Do I need the special one for the NEX5? I bought Gel Stick and Sticky papers earlier this year; after I saw oil spots on my D7000. I had already sent my D7000 to Nikon and they did do cleanup and it seems OK now. But; I have not used Gel Stick yet; as a matter of fact to protect from drying it out; I have kept it in original sealed mailed package that you sent to me. Q-01. Should I try to clean D7000 sensor twice a year with Gel Stick even if I do not notice any spot? Is it recommended to clean twice a year? Q-02. I think you mentioned that it is Ok to store for a long time; but, should it be kept/placed in protected mailed PKG (including box) until I am ready to use; since I have not opened it yet? Q-03. Last stupid question; when should D7000 be cleaned with Gel Stick? Schedule I clean every six month regardless use or after heavy use and what is considered heavy use in number of shots/pictures that are taken? (I am not professional Photographer, but as a hobby; I take several pictures). Thank You in advance to for your help. The Gel Stick worked perfectly for me. I have kept the stick stored in its original shipping container that I ordered from this site and have used it time and again with stellar results repeatedly. As to your establishing a routine or cleaning schedule, I guess it really depends on your use of your camera, frenquency of lens changes, and environment in which you shoot having an impact with resulting particulates on the sensor. The above cited article has helped me assess my camera's need for cleaning and may be of benefit to you (singly or in addition to a defined schedule / process). I have both Sony camera and Nikon camera. If I buy only Gel stick for SONY will do the job? I don’t want to buy 2 sticks. Just wanted to thank you for the stick. It did a bang up job on my d800. Is Eyelead the manufacturer of Sensor Gel Stick ? Is it based in Germany? They have no facilities in China? Are you the only distributor in the US? Gary, yes, Eyelead is the manufacturer of the Sensor Gel Stick and it is made in Germany. There is a facility in China, but it only manufactures the aluminum and external case. All other parts come from Germany. And yes, we are the only distributor of the product in the USA. Amazon has this product from Eyelead on their site. Are you the distributor through Amazon or are you no longer the only distributor? What is interesting is that 10 sticky papers come with this product on Amazon. My understanding is that it is supposed to come with 12 sticky papers…. Steve, no, I do not resell through Amazon. The only legitimate seller on Amazon is Eyelead Germany – you can find the products at Amazon.de. Please do NOT buy from any other reseller, since those are all fake units! I have had a number of people complain, with one person having their AA filter replaced, since the fake version ripped the AA filter right out of a D4 camera! Thanks for your response, Nasim. I do know that fakes can abound. This particular Amazon posting says it is Eyelead that is selling it. However, I will stick to buying from what I know will be a reputable site and business when the time comes. Sorry for the long post below. : I bought the orange Sony version to use on my Sony A7s sensor as it accumulated a few large dust spots. After the first use the original spots were gone, but the was a lot of dirt left on the sensor that looked like residue left from the stick. I did repeat the procedure a few times to no effect. I must note a few things here: I did use the sticky paper before the first use and between subsequent uses. During the first run the gel felt more sticky then on subsequent runs. I even washed the stick once as it was suggested that it may restore the stickiness. If it did, it was barely noticeable (I would not expect much of a change for a new gel stick). Anyway, the gel stick would not pick the dirt from the sensor. I guess my next step wold be to have it wet cleaned in a shop, I am not sure I am up to doing it myself. Are there any other options to try? In regards to your sensor, there should be no residue left whatsoever, since this particular product does not leave any (and we have tested it extensively). What you are seeing is probably oil or some other dirt that got moved around (which explains why the product was sticky at first, then got less sticky). Please keep in mind that while the product is great for removing dust and fresh oil, if you have any other foreign material and old oil spots from the shutter mechanism, those might not get picked up. If you see anything like that on the sensor, I would not use the stick all over the sensor and only concentrate on the affected area, then clean the gel head in-between. In your situation, the best thing to do at this point is probably to get it wet cleaned, then use the sensor gel stick afterwards to clean up the remaining stuff from the wet cleaning. Before you do that though, please make sure to wash and air dry the sensor gel stick. Wet cleaning is very easy and you can use a number of different products to do that. 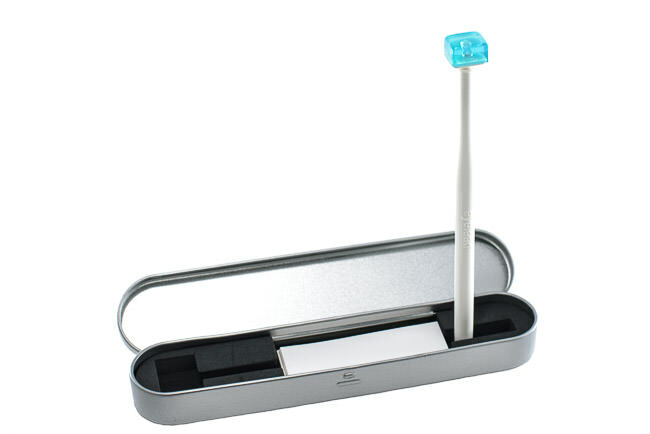 My personal recommendation would be to get Visible Dust’s V Swabs with their sensor cleaning liquid. Hope this helps! P.S. We have sold over 400 units of the orange Sony version and we have not seen a single complaint. Both LensRentals and BorrowLenses use our products (regular and Sony version) to clean hundreds of cameras every day. : Well, it may have been a user error, it may have been a faulty gel. In my case the sensor looked mostly clean with the exception of two visible dust specs that were stuck. Now, what’s left on the sensor looks more like like lint or gel residue with a few line patterns in some places (my guess is it’s from the edges of the gel rectangle). Unfortunately I do not have any means to photograph the sensor with the appropriate lighting. I will see if BorrowLenses shop can fix it for me, luckily I live close to one. P.S. Good job on keeping your product review page clean! Yury, I only took down the comment from the product page, because it was a question, rather than a review. I thought it would have been more meaningful to discuss the issue, rather than leaving an unanswered question. If you have no experience with the wet cleaning process or do not want to try it, I would be happy to clean your camera sensor for you. I won’t charge you for it, since I would like to see what happened and hopefully get your confidence in using the product in the future. If there is a fault in the product, I will replace it free of charge as well. While I have personally tested the orange version extensively on many Sony cameras (including the A7 and A7R), there is always a chance that either the product itself was defective, or something else happened. Please let me know how you would like to proceed. Again, my goal is to make sure that your frustration is fully taken care of and I promise to do everything I can to make you a happy customer. Nassim, thanks for the offer to clean the sensor for me, but I’d rather not get into shipping the camera back and forth if it can be done locally (I am in SF Bay Area, CA and you are in Colorado, based on the G+ profile, correct?). I’ll check with BorrowLenses in the next few days and see how it goes from there. Nassim, you mentioned that you tested the stick with Sony A7 and A7r. I have an A7S. Could there be a difference in the sensors surfaces that would explain my case? would you be so kind to follow up your actions? Were you able to restore the clean condition of your sensor? I am asking because exactly the same thing happened yesterday to me on my Nikon D750. Milos, I sent you two replies – have you received my emails? I just did, Nasim. Thank you for the fast reply . It is encourageing that you know the root cause and the solution. I replied on your other blog. Just wanted to get an experience of someone who faced this. It was very hard to find people who had any issues with this gel. I guess that is a good thing, right? Is the gel stick safe to use on the D810? Nasim- can the gel stick you describe be used on Fuji mirrorless cameras – specifically the X-T1? Hi there, can the orange gel stick be used on Nikon cameras? I have a D750 and seem to have received the wrong one from Amazon… Is it ok to used this one on my sensor? I used the gel stick for the first time today on my Nikon D800. It does a great job picking up dust spots, etc., but leaves behind a LOT of residue from the gel stick. I live in a very warm, humid climate. It’s currently 86 degrees indoors with 61% humidity. Could this be affecting the gel? Hello, can I use it for D800 and D810? Hi Nasssim – it seems that the sensor cleaning kit I received is not working as described in your video attached, etc. It has no gripping feel to the sensor itself, and I did try to touch it on the adhesive paper first then the sensor method as well. The Gel seems ‘dry”. I was cleaning my Sony A7RII sensor and it still shows a lot of dirt. Needless to say I am very disappointed with the results & wonder if the kit is defective or am I not using it correctly? I did not try washing it with tap water but it seems it is really dry, and does not offer any gripping power? Please note that you do not want the Sony version of the product to be very sticky, as the sensor on the Sony cameras, specifically on the A7 II and A7R II is very delicate. If it sticks too much, it might damage the stabilizing gyro that holds the sensor, which is not what you want. Now in regards to removing debris from your sensor, are you sure it is just dust that’s sitting there? I have seen many cases where the shutter mechanism spits out oil on the sensor, resulting in debris that is impossible to clean with a dry cleaning method. Sometimes you need to perform a wet clean first, then use the dry clean method with the sensor gel stick. I wonder if your camera has this problem and you are seeing oil instead of dust. Usually happens initially when the camera is brand new and I have seen it on every brand camera, including Sony mirrorless. If you don’t believe me, you can try googling yourself – there are many reports of oil on Sony A7 series and NEX series cameras. Here is what I would recommend – try to do a wet clean using a solid solution like Photographic Solutions sensor swabs: www.amazon.com/Senso…olife0c-20 then see if the specks go away. I would only recommend the Eclipse sensor solution, since it can easily deal with oil on the sensor. You might need to use a couple of swabs to remove the sitting oil, but it should work. After oil is removed, you will find the sensor gel stick to do a phenomenal job with removing regular dust. The sensor gel stick can remove some oil, but only if it is fresh and it can only deal with certain types of oil. If the surface of the gel touched oil, I would recommend to give it a wash. Just wash it in regular tapped water, then let it air dry. After it is completely dry, use the sticky paper to clean the surface and it will be as good as new! And if at any point of time you are not happy with the product, you can return it back. I will take it back even if it goes outside the 30 day window for you, since I want you to be a happy customer. We have sold thousands of these to the Sony community and the feedback we get is always excellent. To be honest I think your last discussion answers my question however; I assume the Sony Gel Stick is ok to use on the new Sony A7R II? I used it on my A7R without any problems and it worked extremely well. Toni, yes, the product will work perfectly fine on the A7R II – I have used it on mine a number of times without problems. The only concern is – please be extremely careful during the process, since the sensor moves. You do not want to be applying much pressure or moving the sensor around, as it is a delicate mechanism. Toni, the stickiness decreasing is normal, but there is an awesome tip – simply wash the tip of the gel stick in distilled water and let it air dry. Once you do that, the product will be as good as new! And the best part, you can do this over and over again! Can the orange gel stick be used on the Fuji XPro 2 with the new Xtrans sensor? I’ve been using one of these (>I thinkeverything<, which can be horrible. I have used a lint free cloth moistened with propanol (normal "IPA", industrial alcohol) to wipe the gel pad on, which removes anything it picks up, and renews its stickiness. Getting the gel just slightly moist with alcohol makes it much MUCH more effective at stippling small oil dots away. As you use it, the alcohol evaporates, so you can stipple away any smear. Other fluid methods spread oil around a lot and make the job bigger. I also do microscopy, which can mean tiny effective apertures, and eveything on the sensor shows up. ONLY the gel stick works. I wondered if you have any warnings about contact with alcohol? Hi Nasim. I asked my sister (felicisima) in the US to buy me 1pc each of sensor gel stick and sticky paper thru your website. May I know the status of her purchase? The order number is 129363 with order receipt date of July 10, 2016. Thanks. I bought one of the Sony gel sticks, but on first use out of the box it’s not sticky enough to pick up any dust on my A7rII. I tried washing it as per the maintenance instructions, but still nothing. I also own the Nikon gel stick and it’s night and day between the stickiness of the two. Is mine defective, or am I just doing something wrong? Feel free to follow up with me over email. May I inquire again the status of my sisters’ (felicisima) purchase to buy me 1pc each of sensor gel stick (orange color for a6000) and sticky paper thru your website? The order number is 129363 with order receipt date of July 10, 2016. Jojo, we are completely out of stock of the Sony version. Expected ETA for arrival of new stock is mid August, that’s when we are planning to ship everything out. If you would like to cancel your order, I can do that and issue a full refund. I apologize for the wait! I am going to wait by mid August as I really need the stick and the paper for my a6000. I would greatly appreciate if you could kindly inform me thru email if my 2 orders are already shipped out by then. Thanks. Is it safe for the Pentax K1 ? I am interested in the Sony version for my Fuji X-T2. It doesn’t seem Eyelead Germany is offering that through German Amazon. Is it only available through your USA site? I’m in Hong Kong and postage from USA to Hong Kong is quite expensive. Thanks. I’ve used the gel stick for my Fuji X-T1 and X-T2. Is there any reason why it won’t work on the X-T3? A similar question: Any issues using the Sensor Gel Stick on a Nikon Z7/Z6 due to the in-body stabilized sensor (which I understand locks when the camera is turned off)?